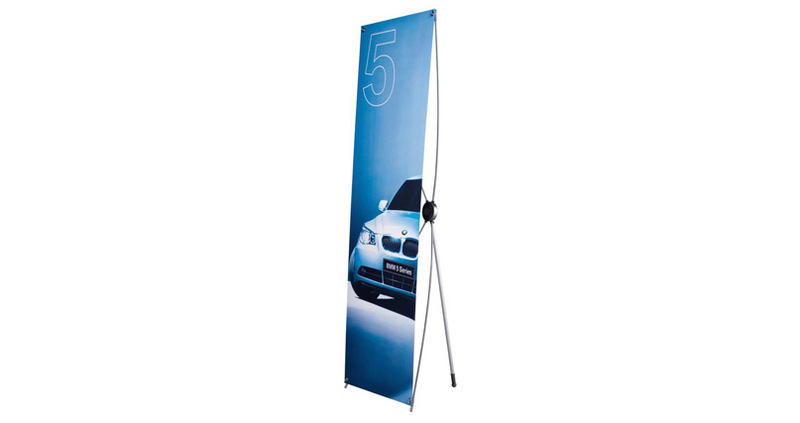 The X-Frame is a lightweight tension banner frame with a vinyl graphic that is attached at the frame at each of the four corners. As the graphic doesn’t retract, there is no need for a casing – this makes the display incredibly lightweight at around 1kg. The high quality digitally printed graphic that you receive with these banners has been printed on ultra smooth vinyl. This process results in bright, vivid colours and clear, crisp images. Displays Direct has been able to acquire this product at a greatly reduced price, so we can therefore offer a limited number at a special price when ordered in groups of two. Simply order two banners with a single artwork for $360 (or $180 each)! How does a tension banner differ to a pull-up one? A tension banner doesn’t retract into the base. Instead, the graphic is stretched across the frame and secured by four eyelets in the corners. I want to order 2 banners at the special price but don’t want the same artwork – is this okay? Yes, the banners can have the same or different graphics when ordered at the special price. Is the X-Frame sturdy and well constructed? Don’t let it’s budget price fool you – the X-Frame is a premium quality, European frame that we’re able to offer at budget prices.